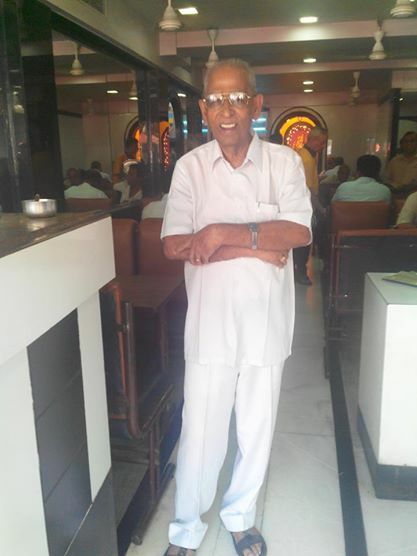 Meet Gajanana of Dwarka Restaurant at Nagindas Master Road (Fort). Every time I’ve been here I’ve found him to be one of the most enterprising and welcoming people at that busy, hectic, always packed restaurant during lunch time. His job probably is to just offer nothing but a smile, excellent customer service, talk to the customer, not sell them on anything but pure joy! A couple of things I noticed a few times. Unlike many other restaurants where people are just going on and about taking orders, delivering them, giving the bill and letting the customers walk away, he has a very personalized interaction with a lot of customers who come in everyday. “Come, come, I have reserved a seat for you.” He says that with a smile to almost anyone and everyone who come in during lunch. “This much of my life is over! Now only this much is left. So I won’t lie.” And then smiles cheekily… The customers smile back and I do too, without him noticing that. He hails from Murudeshwar, Karnataka and probably is also the owner of the place, pretty much like the old uncle at Britannia Restaurant! He truly spreads a lot of joy and happiness especially in a city where we need some smiles rather than the frowning, grumpy faces. Such people are gems of this city. With the busy, hectic, rat race driven rut that people live in, Mumbai needs more freshness like him! 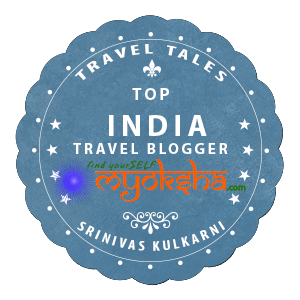 This entry was posted in West and tagged Bombay, food, Maharashtra, Mumbai, Restaurant, Travel on April 6, 2014 by srinistuff.